Fashionista in the making wearing one of our blouses. Summer is full blown now and there’s ne’r a dull moment. Antigonish and Aphrodite have been abuzz with activity. Our vibrant Main Street is enhanced by the Art in the Park event every second Friday. The spirit is contagious as the artists and chefs bring out their best for this festive occasion. The first one just happened. Don’t miss this upcoming Friday’s event during Highland Games week. Another great day trip is to the Old Barn Gallery at Beaver Dam in Pomquet. Carol Rivoire has just reopened it for the summer. http://www.oldbarngallery.ca/ and is now creating her own paintings! The Antigonish Visitor Information Centre hosted a fabulous fundraiser at Gabrieaus Bistro this past week. Marc demonstrated his culinary genius with an exquisite five course meal, each one paired with a brilliant wine from Luckett Vineyards in the Valley. We were regaled with stories by the very funny Pete Luckett of Pete’s Frootique fame and his lovely daughter (and clone) Sophie. I had the good fortune to share our table with the proprietors of Steinhart Distillery – another jewel in the crown of Antigonish County. They officially opened this year and are a must visit destination in Arisaig. https://steinhartdistillery.com We plan to do an event with them soon. 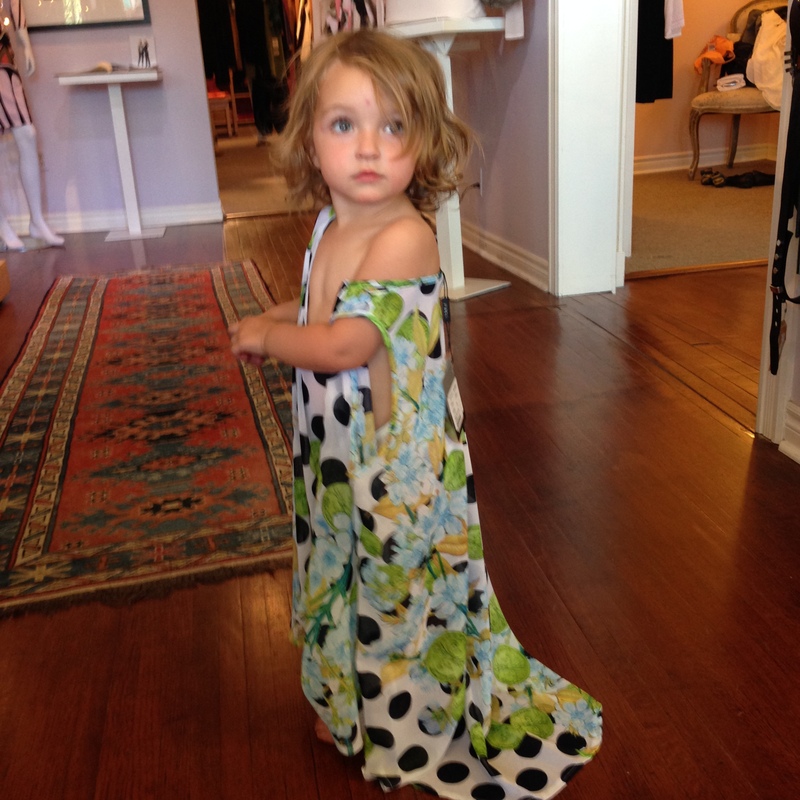 In between there were moments at Aphrodite that I had to share – like the one with little Claire who insisted on trying on clothes with her mother. From fledgling style to advanced style we see Nellie in her great new party outfit – note; even her pedicure matches her dress. Very cool! Check out Karen Goldsberry whose fashion sense is inspired by her pet peacock. Seriously. Karen is one of the great wait staff at the Townhouse – just about the best pub anywhere with craft beer and organic food. You will identify her by her signature long feather earrings that she also makes. They can be found at Aphrodite. This week we are deep in preparation for the Antigonish Street Festival coming up Thursday, July 9 from 10 am to 4 pm. Aphrodite will be bringing out the dogs again at our annual Dog and Bone Fashion Show at 2 pm. More on this tomorrow. Mark your calendars! Now enjoy some images of the recent Goings On…. This looks so KOOL! Canât wait to see it all for myself. To Unsubscribe at any time, please just reply with the word “Unsubscribe” in the Subject line. This communication may contain information that is privileged and confidential. Any unauthorized use, copying, review or disclosure is prohibited. If received in error, please delete the email and contact the sender at the telephone number or email address above.